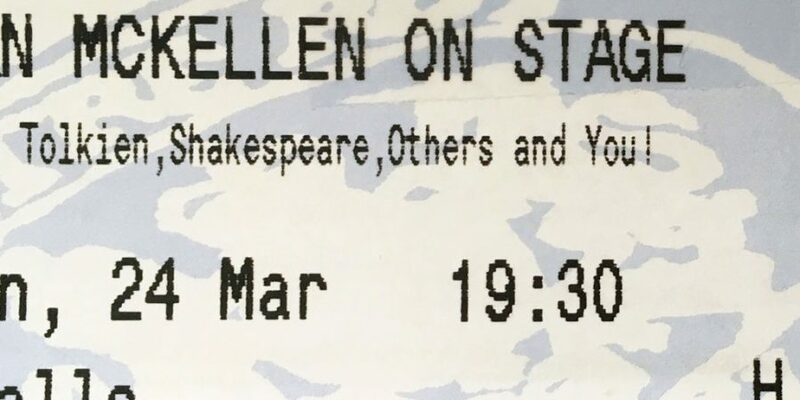 In an interview last year about his one-man show tour of 80 venues to celebrate his 80th birthday year, Sir Ian McKellen said, ‘This is not a farewell tour – I’m saying hello again.’ And it was wonderful for the audience in Bath to say hello again and welcome Sir Ian with his one-man show on the stage of The Theatre Royal where he last performed in Waiting for Godot. This was McKellen’s 29th gig and the huge dressing box/travelling trunk, which dominated the stage, displayed the stickers from the other 28 venues. Sir Ian triumphantly opened the lid and took out the 29th sticker and stuck it to the side, accompanied by a huge round of applause and cheers from eager fans of the great man. ‘It’s Ilfracombe tomorrow,’ he added and we laughed and clapped even more. Whether you associate McKellen with Richard II or Hamlet, Gandalf in Lord of the Ring, Mel Hutchright in Coronation Street or Freddie in Vicious, when you hear the actor’s name you know that you are in for the experience of a lifetime. Hurrah for his huge body of work, the variety of parts, and the humour, empathy and intelligence which shine through every character he plays. Whether on stage, screen or television, whether supporting or leading, he is recognised where-ever he goes as a star. 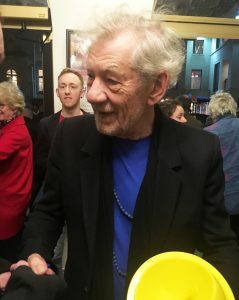 Sir Ian rattles a yellow collecting bucket for the Ustinov Youth Theatre as fans gather in The Theatre Royal Bath foyer to say hello and shake hands after the show. No selfies though. It takes up too much time, he says. Theatre and showbiz were at the heart of the evening with Sir Ian, from his stories about his family of preachers, the early influence of variety acts, of musical theatre by Ivor Novello, the grammar school productions and his time at university. Some of his contemporaries at Cambridge included Derek Jacobi, John Neville, Corin Redgrave and Trevor Nunn and he flourished in this world of academia and acting. He didn’t go to drama school – well, he didn’t need to; he learned his craft from an early age, soaking up all the experiences he had, and then working in provincial rep plays. He finished the evening with Prospero’s final speech from The Tempest, a suitable ending by the magician. At the heart of the show were books – the power of the written word. Under the directorship of Sean Mathias, Sir Ian used books as his main props, extracting them from the stage trunk with great flourish, then opening each to read from the chosen pages. They were genuine books – props as well as prompts, just in case, I suppose … but I‘m positive he was reciting, not reading aloud. He knew all the speeches and poems by heart. During the second half, he concentrated on Shakespeare’s plays, conjuring 37 texts from the depths of his stage trunk. As audience members shouted out play titles, he frantically rummaged for the right book, piling them up as the rain of titles pelted down on him. There seemed to be only a handful of plays he hadn’t appeared in or seen himself. A single spotlight tracked Sir Ian as he took on Hamlet and then Macbeth and then both Romeo and Juliet. However familiar the words, they came freshly coined, and filled the mind again with the beauty of the Bard’s words and the poetry of the soul of the character. The audience was spellbound. It was a beautiful performance, with almost balletic movements as the actor moved to the rhythms of the lines, dramatising the pauses and line breaks with gestures. It seemed a sin to clap and break the spell but we did. It was an unexpected and enthralling piece of dramatic interpretation. If you’re interested, I have found a recording of Richard Burton reading the poem. His wonderful deep lyrical voice and appreciation of spoken poetry, helps us understand Hopkins better. Read the text first to see how it appears on the page. The Leaden Echo and The Golden Echo. To think that this was written in 1885 and none of Hopkins’ poems were published during his life. It was his friend Robert Bridges, poet laureate, who collected his work and arranged for publication in 1918. Like many innovative artists, they were not understood or appreciated in their lifetime. Thank you, Sir Ian, for an entertaining and enlightening evening. Thank you for reminding me of Gerard Manley Hopkins’ poetry which I studied many moons ago. Thank you for your walk-on and scene-stealer part in George Ezra’s ‘Listen to the Man’ video. 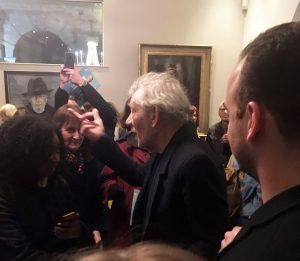 Thank you for your Estragon in Waiting for Godot to Patrick Stewart’s Vladimir at the Theatre Royal Bath – and for all the other plays and films in which I have seen you. Thank you for showing me how you keep working and still enjoy life at 80.